Dr. María-Auxiliadora Cordero is an archaeologist whose main focus is the growth of complex societies in the northern Andes. Her developing interests include the search for early Paleo Indian sites in northern highland Ecuador, where volcanism has impacted their visibility; the diffusion of the sweet potato from South America to the Pacific Islands; functional and chemical analysis of funerary pottery from the Equatorial highlands; and conceptions of “beauty” and ethnic pageants in Ecuador. She has conducted both archaeological and sociocultural research in coastal and highland Ecuador. Research in the area of Lake San Pablo, Imbabura Province, typically reveals sites dated to the late prehispanic period. These are easy to detect because of the presence of large earthen mounds and other earthworks. In contrast, few early sites have been found and studied. However, work carried out in the environs of the lake, together with paleobotanical evidence obtained by colleagues, have led Dr. Cordero to question the traditional survey methodology which has favored finding late period sites in this area. It is likely that earlier sites have been covered or obliterated by volcanic activity. Due to the impact of volcanism and other natural processes, investigation in the area necessitates a close collaboration between archaeology and geology. Preliminary work by Dr. Cordero, collaborating with a geologist, has identified a possible area of a preceramic site. The peoples that the Spanish encountered in the northern Ecuadorian highlands in the 16th century were portrayed in the ethnohistoric literature as complex chiefdoms, with powerful caciques, an elite class, and specialized trade networks. In the area known as the País Caranqui, these peoples built large earthen mounds, agricultural terraces, and raised fields. What caused them to develop social complexity? How did chiefs acquire and maintain control? Dr. Cordero’s book, El cacicazgo Cayambi: Trayectoria hacia la complejidad social en los Andes septentrionales, addresses these and related questions. Earthen mound at Cochasquí archaeological site, Pichincha Province, Ecuador. Pedestal bowls in the Henn collection from the Piartal complex found in southern Colombia/northern Ecuador. In the early 1910s, Arthur Henn, a director of Carnegie Museum of Natural History (CMNH) in Pittsburgh, acquired approximately 300 objects, mostly pottery, in the town of El Angel, northern Ecuador. Most of these pieces were interred with human burials in deep shaft tombs in southern Colombia and northern Ecuador. Henn’s collection, now curated at CMNH, can help archaeologists better understand funerary rituals. Why were these objects buried with people? What do their unique designs signify? Were they associated with social status? Literature reviews, visits to museums with similar collections, and chemical analyses by the laboratory of Ecuador’s National Institute of Cultural Patrimony provide context for the collection and help unravel the meaning behind these funerary rituals. Sweet potato patch and farmer in the Guayllabamba valley, northern Ecuador. Dr. Cordero has collaborated with Professor Richard Scaglion to investigate the spread of the sweet potato (Ipomoea batatas), a New World domesticate, from South America to the Pacific islands. How did this New World crop find its way across the Pacific Ocean before Europeans arrived? 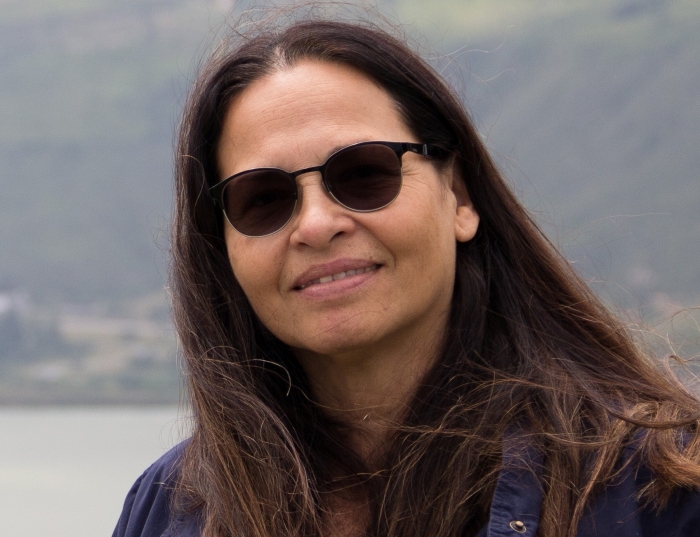 Increasing scientific evidence suggests that Ancient Polynesians may have made landfall somewhere in South America, and Dr. Cordero has applied her knowledge of the archaeological and linguistic data to investigate possible sites for trans-Pacific contact. Her research has helped to identify the Gulf of Guayaquil in southern Ecuador as one plausible location. Candidates in the Ñusta pageant during the Inti Raymi festival in Cayambe. During her many years of archaeological work in highland Ecuador, Dr. Cordero has observed the development of ethnic pageants. “Beauty” pageants (involving the election of reinas, or “queens”) have been important in Ecuador for decades. But a new kind of pageant (involving ñustas, or “princesses” in the Quichua language) has developed in indigenous areas. These pageants do not seem to hold “beauty” as the main quality for the winner, but instead value how the candidate projects her indigeneity. These pageants coexist in many areas: reina/ñusta in Cayambe, reina/chola Cuencana (mixed indigenous and white) in Cuenca, and reina/ñusta in Cañar. Dr. Cordero is investigating the reasons behind these separate pageants and how they relate to issues involving colonialism, racism, gender hierarchies and indigenous movements. 2017 Cordero, María Auxiliadora. “Volcanismo y la búsqueda de sitios arqueológicos tempranos en el área del Lago San Pablo, sierra norte del Ecuador.” In Volcanes, cenizas y ocupaciones antiguas en perspectiva geoarqueológica en América Latina. M.F. Ugalde (ed. ), PUCE—Pontificia Universidad Católica del Ecuador, Quito. 2011 Jones, T. L., A. C. Clarke, M.-A. Cordero, R. C. Green, G. Irwin, K. A. Klar, E. A. Matisoo-Smith, D. Quiróz, J. M. Ramírez-Aliaga, R. Scaglion, A. A. Storey, and M. I. Weisler. “Summary and Conclusions.” In Polynesians in America: Pre-Columbian Contacts with the New World. T. Jones, A. A. Storey, E. A. Matisoo-Smith, and J. M. Ramírez-Aliaga (eds. ), pp. 263–276. Altamira Press, Landham, MD. 2011 Scaglion, Richard and María-Auxiliadora Cordero. “Did Ancient Polynesians Reach the New World? Evaluating Evidence from the Ecuadorian Gulf of Guayaquil.” In Polynesians in America: Pre-Columbian Contacts with the New World. T. Jones, A. A. Storey, E. A. Matisoo-Smith, and J. M. Ramírez-Aliaga (eds. ), pp.171–193. Altamira Press, Landham, MD. 2009 Cordero Ramos, María Auxiliadora. El cacicazgo Cayambi: Trayectoria hacia la complejidad social en los Andes septentrionales. Editorial Abya-Yala, Quito, Ecuador. ISBN: 978-9978-22-858-6. 2007 Scaglion, Richard and María Auxiliadora Cordero. Camote Ecuatoriano en Polinesia: Posible Evidencia de su Difusión en Tiempos Prehistóricos. Revista de Antropología, No. 19, pp. 78-114. Casa de la Cultura, Núcleo del Azuay, Cuenca, Ecuador. 2006 Cordero, María Auxiliadora. La cerámica del altiplano de Carchi-Nariño y los rituales funerarios. Article published in the brochure Geometrías del Pasado for the exhibit of the same name at the Museo de Arte Precolombino e Indígena, Montevideo, Uruguay.